Two new fossil shows a specimen of a small bird wings trapped in amber - the fossilized tree resin - which had been outstanding for more than 100 million years. These findings carried by the international team of researchers, including Professor Mike Benton from Bristol University, published in the journal Nature Communications. Benton said, the specimen was obtained from well-known amber deposits in northeast Myanmar, which has been producing thousands of specimens of insects of all shapes and sizes, as well as spiders, scorpions, lizards, and bird feathers. However, the invention becomes the first of the bird parts was found intact. 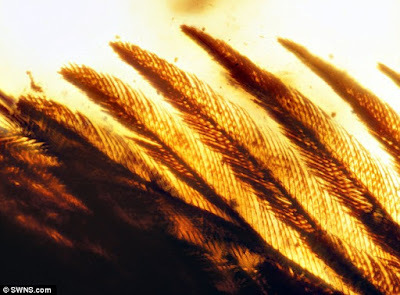 As quoted of the Daily Mail on Wednesday, June 29, 2016, the fossil of wings have two to three centimeters long and has a wing frame, including claws and feathers preserved very detailed in amber. Anatomy of the claw fossil shows that it is an enantiornithine bird that became a large group in the Cretaceous period. But the species was extinct along with the dinosaurs at 66 million years ago. "The fossil of wings shows incredible detail," said Benton. "Each strand of fur shows each filament, there is even a trace of color - in the form of spots and stripes," he explained. The researcher leader, Dr Xing Lida of the China University of Geosciences, also commented on the discovery of fossils of the bird's wing. "The fact that the birds are climbing in the trees show they have advanced development, which means they are ready to move as soon as they hatch," said Xing. "(After hatching) This bird is not just waiting in the nest to be fed, but they look for their own food and die, perhaps because of its small size and lack of experience," he explained.